The Best Airline blogs from thousands of top Airline blogs in our index using search and social metrics. Data will be refreshed once a week. Airline newsletter is a comprehensive summary of the day's most important blog posts and news articles from the best Airline websites on the web, and delivered to your email inbox each morning. To subscribe, simply provide us with your email address. Hopefully traveling! About Blog My name is Ben Schlappig, and I am obsessed with aviation, travel, and more specifically, using airline miles and credit card points to elevate the travel experience. Facebook fans 53,532. Twitter followers 55,080. About Blog This site includes news, reviews, guides and videos and hands-on travel advice how to maximize any trip since the site debuted in June of 2010. Our contributors scour the world looking for great travel deals, creative ways to book flights, and details about the latest changes to all the major airlines, hotels, and credit cards so you can travel comfortably. Facebook fans 1,795,879. Twitter followers 293,833. Seattle, WA About Blog Written by a team of writers across four continents, this is one of the best sites for aviation news and innovation from around the world. We cover aviation, travel and airlines. Home of the AvGeek! Facebook fans 11,560. Twitter followers 102,672. Washington, DC & Global About Blog With a global team of contributors, AirlineGeeks shares the latest news and content from the airline industry. Facebook fans 4,483. Twitter followers 24,832. Planet Earth - At a hotel About Blog Want more from your hotel and airline loyalty programs? LoyaltyLobby will help you maximize your miles and points earning power, take advantage of hotel and airline status match opportunities, and use your points for free hotels, flights, and upgrades. Facebook fans 16,661. Twitter followers 11,807. San Francisco, CA About Blog A place to discuss burning airline miles & hotel points. Facebook fans 1,158,471. Twitter followers 517,461. About Blog FlyerTalk is an interactive community that provides up-to-date information on travel and industry news. We are a living, growing community where frequent travelers around the world come to exchange knowledge and experiences about everything miles and points related. Facebook fans 30,631. Twitter followers 54,592. Long Beach, CA About Blog I write The Cranky Flier, a snarky consumer air travel blog. Yes, I'm an airline dork. Facebook fans 493. Twitter followers 171,820. Florida, USA About Blog Latest News and Photos powered by AirlinersGallery.com Images. Airline Videos, Route Maps and Aircraft Slide Shows. Framable Prints and Posters. Facebook fans 94,170. Twitter followers 2,854. San Francisco, CA About Blog We want this to be a place where people can discuss all aspects of airlines - either from the business, aviation, logistics or passenger side. Facebook fans 1,158,185. Twitter followers 517,182. New York, NY About Blog "Just because it's a great fare doesn't mean it's a great deal". We provide tips and tricks on maximizing frequent flyer accumulation for miles traveled, web promotions, customer reward points and wise redemption of these awards. That’s what we decided makes a deal truly great. Facebook fans 151,559. Twitter followers 157,752. United Kingdom About Blog Routesonline is the home of Routes, the world’s leading aviation network development conferences and events. Plus aviation news and features, and profiles of global airlines and airports. Facebook fans 4,791. Twitter followers 8,637. About Blog InsideFlyer is a privately funded venture based in Colorado Springs, CO. We’re a small diverse group of experienced frequent flyer experts, travel community builders, technologists, and friends of the flyer who want to help you learn to be an expert traveler. Facebook fans 5,249. Twitter followers 21,446. Facebook fans 7,165. Twitter followers 3,084. About Blog Delta's official blog for destination, aviation and travel enthusiasts. Facebook fans 2,063,647. Twitter followers 1,399,805. Seattle, WA About Blog Welcome to the Alaska Airlines blog, a place for us to share news, travel tips and features about our company and employees. Facebook fans 962,409. Twitter followers 271,787. Beijing About Blog Follow my trips to the misunderstood countries such as Afghanistan, Iran or Iraq and share my second biggest passion with me, Aviation. I review airlines on a weekly basis and I have been a guest on the brand new Airbus A350 or the Dreamliner. Facebook fans 7,149. Twitter followers 10,321. About Blog Written by experienced pilot Patrick Smith, this blog addresses commercial air travel issues pulled from the headlines, including crashes, on-board service and innovations. With his personal essays and travel stories, Ask the Pilot offers a unique perspective on airline issues from around the world. Facebook fans 3,520. Twitter followers 4,001. Stockholm, Sweden About Blog Flightradar24 is the best live flight tracker that shows air traffic in real time. Best coverage and cool features! Facebook fans 576,420. Twitter followers 393,339. Washington, DC About Blog Airlines for America (A4A) advocates on behalf of its members to shape crucial policies and measures that promote safety, security and a healthy U.S. airline industry. We work collaboratively with airlines, labor, Congress and the Administration and other groups to improve air travel for everyone. Facebook fans 344,638. Twitter followers 48,108. Amsterdam, the Netherlands About Blog Welcome at the official site of KLM Royal Dutch Airlines! This blog offers insight about the people at KLM, behind the scenes, travelling the world, lifestyle, music & sports. Facebook fans 12,201,652. Twitter followers 2,352,708. About Blog We’ve been around since 1984 with our first flight being the VS001 from London Gatwick to Newark, New Jersey. Since then we’ve come a long way, adding new routes, new products, and new aircraft. Facebook fans 587,024. Twitter followers 567,803. Australia About Blog We’ve developed an extensive list of hotel affiliates, standout cultural and arts organizations, big-name annual events, and a world-class network of airlines, to offer you an exceptional range of packages throughout Australia and across the globe. Facebook fans 693,680. Twitter followers n/a. About Blog Find cheap flight deals at Secret Flying. We provide info on airfares with huge savings to your favourite destinations around the world. Facebook fans 704,188. Twitter followers 95,190. About Blog The Professional Pilots Rumour Network (PPRuNe) is an aviation website dedicated to airline pilots and those who are considering a career as a commercial pilot. HQ: London NY, HK, JP About Blog Flightglobal is the global aviation community’s primary source of news, data, insight, knowledge, and expertise. We provide news, data, analytics and advisory services to connect the aviation community globally and help organizations shape their business strategies, identify new opportunities and make better decisions faster. Facebook fans 14,755. Twitter followers 97,239. The sky About Blog Flying with Thomas Cook Airlines means you have the reassurance of the best-known name in travel – it’s our business to make sure all our customers are well looked after. Sunny Skies is here to help you plan your trip and the place where to share your personal experiences with other readers. Facebook fans 519,705. Twitter followers 31,440. About Blog ExpertFlyer.com is designed to offer information about air travel to anyone who wants or needs access to the vast array of air travel information in an easy to use the form that is otherwise not readily available. Facebook fans 7,041. Twitter followers 11,377. About Blog AviationCV.com is committed to providing a high quality of services that support aviation professionals and airlines, enabling them to achieve their goals. Facebook fans 82,694. Twitter followers 107. Australia About Blog Follow us to keep up with The best guides, deals and tips for frequent flyers. Facebook fans 75,129. Twitter followers 2,281. Dallas, Texas About Blog Follow for Southwest Airlines latest news & stories about the greatest Employees & Customers in the world. Facebook fans 5,680,556. Twitter followers 2,173,376. Traveling the world, frugally About Blog The Frugal Travel Guy blog was founded by Rick Ingersoll in 2007, to educate readers about the value of frequent flyer miles and points. The FTG team has since traveled the world extensively in first and business class, for minimal out of pocket cost. By leveraging rewards credit cards, we’ve shown thousands of readers how to do the same. Facebook fans 80,177. Twitter followers 69,318. Your local newsstand About Blog A Global Review of Commercial Flight since 1994. Airways Magazine is the leading Commercial Aviation publication with over 22 years of constant distribution. Facebook fans 164,845. Twitter followers 55,864. Worldwide About Blog Around the world and multistop travel tips and news from the team at AirTreks. Facebook fans 12,454. Twitter followers 5,102. UK About Blog NATS is a global leader in innovative air traffic control and airport solutions. Learn about what NATS do from the people that do it. Our Air Traffic Control experts share their expertise on a wide range of topics via our company blog. Facebook fans 15,191. Twitter followers 27,028. Irving, TX About Blog The largest regional carrier for American Airlines. Envoy Air Inc. is a wholly owned subsidiary of American Airlines Group, operating nearly 150 aircraft on about 800 daily flights to more than 140 destinations. Facebook fans 3,386. Twitter followers 1,971. Luton, UK (HQ) About Blog The world leader in aviation intelligence, OAG is relied upon globally for essential information and insight. Helping the world’s airlines, airports & travel-related service companies with real-time flight schedules, flight status data feeds and aviation analytics. Facebook fans 10,264. Twitter followers 8,123. Facebook fans 8,363. Twitter followers 1,252. About Blog Official website of Sam Chui Aviation and Travel. Travel Deals, Photography, Video, Airline Reviews and Flight Experiences. First and Business Class Trip Report. Facebook fans 27,721. Twitter followers 2,211. Europe About Blog Inflight meal reviews and information on what to eat inflight on over 150 airlines worldwide. A blog and information site all about airline food. Facebook fans 3,676. Twitter followers 5,294. Europe About Blog Airline food reviews, blog posts and videos all about the wonderful world of airline food. We feature over 150 airlines and their airline food options! Facebook fans 3,593. Twitter followers 5,149. Facebook fans 1,597. Twitter followers 2,112. About Blog The latest from the Airline Passenger Experience Association, sharing news and views from events around the world. Facebook fans 3,216. Twitter followers n/a. Facebook fans 188,441. Twitter followers 7,140. PDX About Blog Well Traveled Mile is to learn how to maximize earning credit card reward points and airline miles that you can use to travel for free. We’ll keep you updated with offers, deals, and tips that will help you earn points and go travel! Facebook fans 746. Twitter followers 417. About Blog SA Airlines is your premier online destination to book cheap flights on South African Airlines such as SAA, Mango Airlines, Kulula.com, SA Express, British Airways South Africa and SA Airlink. About Blog A Guide to Points, Miles and Free Travel. Facebook fans n/a. Twitter followers 4,093. Barcelona, Spain About Blog From the latest aviation advancements to executive viewpoints and customer successes, keep up with Accelya's blog. Facebook fans 1,005. Twitter followers 459. Dayton, Ohio About Blog Catch up on all the latest news and highlights from PSA Airlines. For more information, join our mailing list. Get the latest from PSA here! Facebook fans 14,530. Twitter followers 2,618. About Blog We write about airlines, routes, airport news, where to spot, spotting hotels and more. Facebook fans 1,916. Twitter followers 299. Worldwide (YYC) About Blog The Frequent Flyer Bonuses websites are the most comprehensive guide of travel reward program bonus offers on the Internet. Whether you are flying, sleeping, driving, buying or anything else that can earn miles or points, if there is a bonus you'll find it here. Facebook fans 3,912. Twitter followers 8,290. St. Louis, MO About Blog Premier regional airline operating as United Express and Delta Connection. Facebook fans 7,521. Twitter followers 1,855. U S About Blog The Mileage Club Blog is a place where you can find informative blogs about airline miles and travel tips on how to use miles and travel for less. Facebook fans 4,207. Twitter followers 3,293. About Blog Payless Flights Inc. is a Florida based travel agency. We specialize in discounted International airline tickets. We offer services on the phone and online. Facebook fans 24,264. Twitter followers n/a. India About Blog Indian Civil Aviation Industry NEWS. Started in 2006, Indian Aviation News Net today is the most sought after website on aviation scenario in India. Facebook fans 2,058. Twitter followers 1,104. Truly Global About Blog The world's leading airline marketing strategy firm We believe flying is magical. We help visionary aviation executives build remarkable brands. Facebook fans 4,644. Twitter followers 21,983. About Blog Amadeus offers innovative technology solutions in 48 African countries, helping travel agencies connect with global airlines, hotels, and car rental providers, and serving travelers better than ever. Together we shape the future of travel! Facebook fans 12,739. Twitter followers 1,123. USA About Blog Blog about business class flights and first class flights, read how you can get the cheapest business class flights. Facebook fans 23,873. Twitter followers 1,894. Toronto, Ontario About Blog Book Airport Limo & Taxi Service online in Toronto, Mississauga or anywhere in the GTA. Airline Limousine has been the #1 choice for Pearson airport limo service since 1936. Our fleet of 165 vehicles in Canada are approved by the GTAA. Facebook fans 4,207. Twitter followers 406. Syosset, NY About Blog A blog about American jet airliner 787. Facebook fans n/a. Twitter followers 1,326. Chennai IN About Blog Exclusive blog for air travel, airline news, deals, tips and more. From India to across the world. Facebook fans 643. Twitter followers 3,875. Austin, TX About Blog The latest in airline delays and cancellations, airline regulations and traveling to and from Europe. Facebook fans 3,172. Twitter followers 1,134. About Blog PrimeFlight provides airline services, aircraft services and airport services using cutting-edge technology and a commitment to safety. Facebook fans 1,204. Twitter followers n/a. About Blog Group travel, non-profit travel, church travel, humanitarian airfare, missionary airfare worldwide. Facebook fans 910. Twitter followers 1,101. 41,000 feet. About Blog Written by Air Force veteran and current commercial pilot Chris Manno, this blog addresses topics like plane reviews, dispelling travel rumors, and what pilots really deal with. Facebook fans n/a. Twitter followers 5,570. About Blog The Philippine aviation scene has plenty of surprises in store. We are trying to chronicle the relevant events from orbital satellites to human powered flights and all in between as we possibly could. We are also trying desperately hard to be accurate and factual as far as possible. Hackensack, NJ About Blog Airline app for ultra-affordable, space-available tickets. We make use of the airline’s unsold capacity to help add revenue and turn them over to our members who are willing to fly at a moment’s notice. Facebook fans 4,777. Twitter followers n/a. About Blog In memory of the late Jim Rustik, This new blog sets out to continue his great work in providing information on Boeing Test Flights in the Puget Sound area of Seattle WA. Reports will cover first flights & deliveries where possible from Renton, Boeing Field & Paine Field. Any updated contributions most welcome. Just south of Nashville, TN About Blog The opinions expressed here are my own and not those of my current or former employers. Please enjoy this blog about my personal experiences working in the airline industry. Facebook fans n/a. Twitter followers 3,245. India About Blog Network Thoughts a blog on everything about aviation by Ameya. Airbone About Blog FlightNuts is the place to buy, sell and trade frequent flyer miles and other types of credits, and stay up to date on news and info about rewards travel. Facebook fans 1,173. Twitter followers 5,098. Saskatoon, SK, Canada About Blog Learn about what’s happening on the Airline Hotels Blog: Our hotel management company is winning awards, giving back to the community, and occasionally adding a new hotel to our family. Facebook fans 284. Twitter followers 374. About Blog A personal and light-hearted take on navigating the commercial airline business in Canada. A humorous writing style paired with useful tips and advice make this a very enjoyable read. Honolulu About Blog We cover airlines, airliners, and flights that are rare to Hawai‘i. We also cover airline media events at HNL, airline news affecting Hawai‘i, rare birds visiting Neighbor Island airports, biz jet versions of airliners, and military rare birds. Facebook fans 1,016. Twitter followers 544. About Blog Captain Shem Malmquist has been involved in aviation safety work since 1981, working in multiple aspects of aviation safety, from charting procedures, aircraft design to human factors and weather avoidance. Facebook fans 266. Twitter followers 42. About Blog Flights From Hell is a fun flying blog with true stories about airline travel written by airplane passengers, flight attendants and pilots. Facebook fans n/a. Twitter followers 631. About Blog Living at 34,000 feet. Air Travel Whirled News! Facebook fans 7,657. Twitter followers 1,146. About Blog Trip reports on airline flights: business class, inaugural and farewell, and 787 Dreamliner. Also, my trip around the world. About Blog Your source for airline route maps and terminal diagrams from around the world. Facebook fans 169. Twitter followers 1,498. About Blog Schedules and brochures for airlines. History of aviation. Timetables and brochures showing airline history and memorabilia. Facebook fans n/a. Twitter followers 456. About Blog Your Guide To Airline Miles Credit Cards. Airline Miles Experts compares the top airline miles credit cards & reveals hot tips to earn more miles. Facebook fans 2,451. Twitter followers 12,147. New York, USA About Blog Buymiles.com is a platform for travel agents and mileage brokers that help them to buy miles accounts and view all the frequent flyer accounts under one roof. Facebook fans 192. Twitter followers 335.
nomadic About Blog MileValue.com is the premier source of earning and redeeming frequent flier miles, so you'll be enjoying Free First Class Next Month. Facebook fans 7,294. Twitter followers 13,908. Seattle Washington About Blog Karlene Petitt shares what it takes to become a pilot and how to be successful. This blog showcases the inner workings of aviation, down to the abbreviations and organizations. Facebook fans 1,904. Twitter followers 27,381. Doha, Qatar About Blog Welcome to the official Tumblr blog of Qatar Airways. Connecting you to more than 150 destinations worldwide. Facebook fans 13,330,616. Twitter followers 1,296,588. About Blog Airline Photo Galleries and Aircraft Slide Shows. The latest photo uploads to the AirlinersGallery.com photo library. All images are available as framable color prints in 6 sizes and sold in 6 currencies. Facebook fans 487. Twitter followers n/a. About Blog Latest news about Airline authored by Behramjee. About Blog Stories and experiences of a young pilot working his way up the aviation ladder with a real and personal look at the struggles and joys of being a pilot. About Blog FlyersRights, the largest non-profit airline consumer organization. About Blog With theairmiles.com, buy frequent flyer miles at unbeatable prices and make it possible for you to travel to your dream destination. About Blog An occasional blog covering frequent flyer programmes, credit cards, hotel and other loyalty points schemes. Facebook fans n/a. Twitter followers 45. About Blog The Aviation Branding Weblog that publishes news. trends and backgrounds about aircraft livery design & airline branding. About - Whether you are an airport, airline or ANSP, NATS is ideally placed to help you meet every fresh challenge. We provide answers to the critical issues faced by the aviation industry around the world – such as cost-efficiency, environment and data use – and have built our reputation on delivering a first rate, safe and efficient service. About - Required Reading for Frequent Flyers. The UK's most widely-read site for British Airways Executive Club, Virgin Flying Club and other major airlines and hotel loyalty schemes. About - The No.1 Site for Airline Product News and Reviews. About - Routesonline is the home of Routes, the world’s leading aviation network development conferences and events. Plus aviation news and features, and profiles of global airlines and airports. 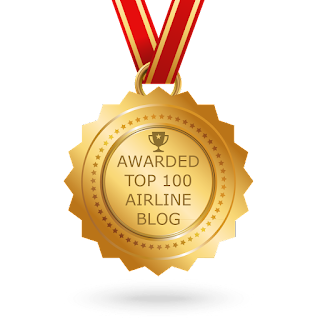 CONGRATULATIONS to every blogger that has made this Top Airline Blogs list! This is the most comprehensive list of best Airline blogs on the internet and I’m honoured to have you as part of this! I personally give you a high-five and want to thank you for your contribution to this world.